Again, thank you for the professional job, and “clean-up” service. Never have I had technicians, etc, clean up after a job as you, and Travis have. We love the floor! It adds a real elegant, yet “pet friendly” feel to our outdoor living room. I know I will be referring many new customers. ~ Chris, Vero Beach, FL. Thank you for taking the time to let us know about your experience Chris. We appreciate your offer to refer us to your friends. Word of mouth referrals are our very best source of new customers. We strive to do every job in a way that will allow customers to refer us to their friends without any reservation. 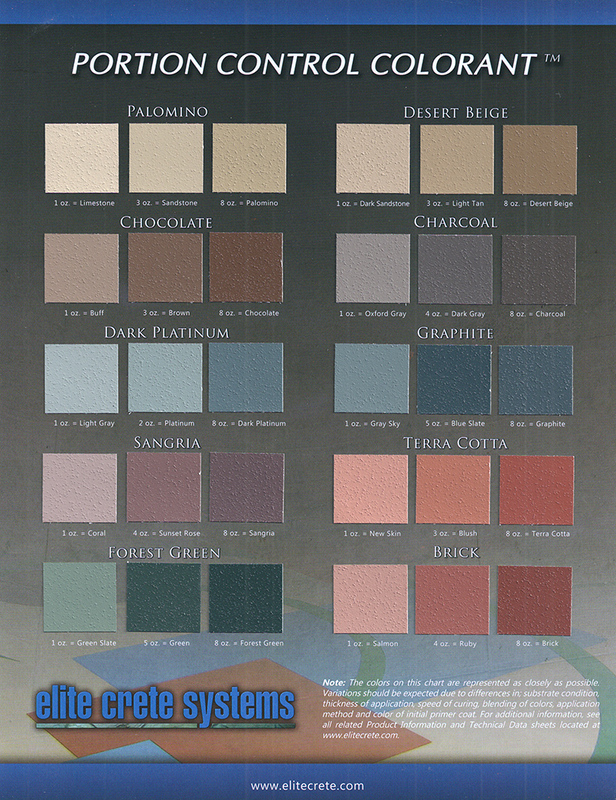 Here is a chart of epoxy color options available from just one manufacturer. Within each epoxy color family shown below, the shade is infinitely adjustable to give you the exact shade you want for your high performance epoxy over concrete flooring project. The subtle texture of this high performance Elite Crete coating makes it ideal for decks, and patios, where good traction is important. We carry high performance epoxy coatings from many different manufacturers so we are sure to be able to install just the right look to set off your design project. Contact us with questions or to get a quote now!